"My experience working with Bob Bianco . . ."
Situated on the North shore of pristine Lake Pend Oreille, Camp Hatfield is located in beautiful Sandpoint, Idaho, just an hour from the Canadian border and in an area of incredible natural splendor. Not just a summer camp, this multi-seasonal recreational home was designed and custom built around the Hatfield family’s desire to recreate the historic summer camps of yesteryear. Based on fun and health with family and friends through sports and camp activities, Camp Hatfield is a private family retreat that combines traditional aspects of old summer camps with a functional, aggressively creative, modern design aesthetic. Uniquely outfitted, every aspect of the house reflects a nonstandard, custom built approach to details. Borne of creative latitude and expression, Camp Hatfield is like no other place. The creative design allows a combination of communal bunk house, mess hall and living spaces with private bedroom suites that can accommodate a gang of more than twenty-four campers. From inception to completion, Camp Hatfield reflects the application of environmentally responsible practices through the use of locally sourced, natural materials as well as progressive, high-tech products. Green building techniques and materials such as Panelite, Trespa and others were used throughout the project. Environmental sensitivity was central from the beginning of construction to project completion and is also a main tenet of everyday life at Camp Hatfield. R.W. Bianco Construction is proud of our ability to provide truly custom service to the Hatfields during the construction of this unique luxury residential home. This lakefront home was complex and detailed from start to finish; the tremendous results speak to R.W. 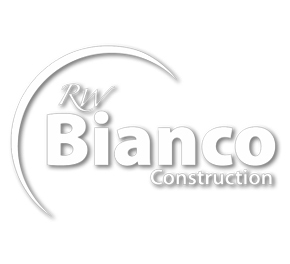 Bianco Construction’s skill as not just general contractors, but as custom builders/artisans.